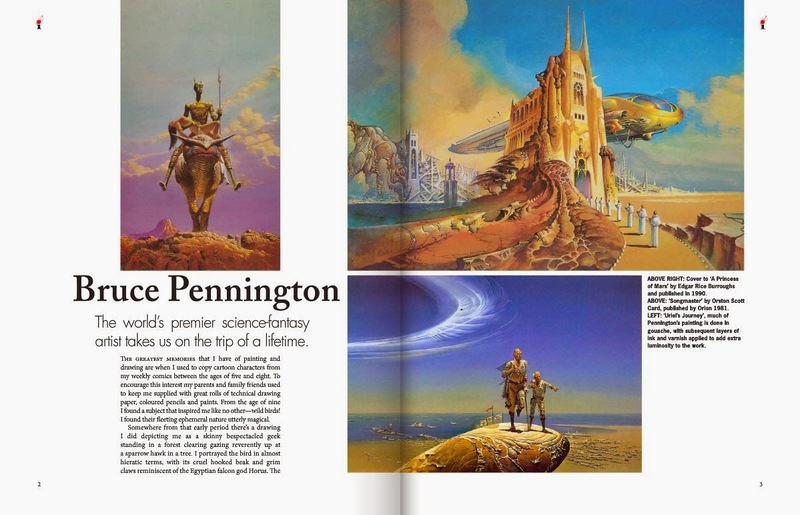 Any magazine that can boast almost 40 pages of Bruce Pennington artwork is going to be a winner. From its cover—originally painted for Brian W. Aldiss's Space, Time and Nathaniel, published by New English Library in 1971—and on through page after page of covers, this issue of Illustrators brought back a lot of very happy memories. Although I had read science fiction before, I became a convert at the age of 12 and read SF exclusively for the next decade. It was the perfect time to discover SF because in the mid-1970s there was a paperback boom. And there was Science Fiction Monthly, a mix of poster magazine and... well, magazine, with stories and features that introduced me to many new writers, both old and new. Bruce Pennington was all over Science Fiction Monthly, including posters of his best works (my earliest favourite was a Corgi cover for Poul Anderson's Satan's World) and an interview—the first interview with a science fiction artist I had ever read. 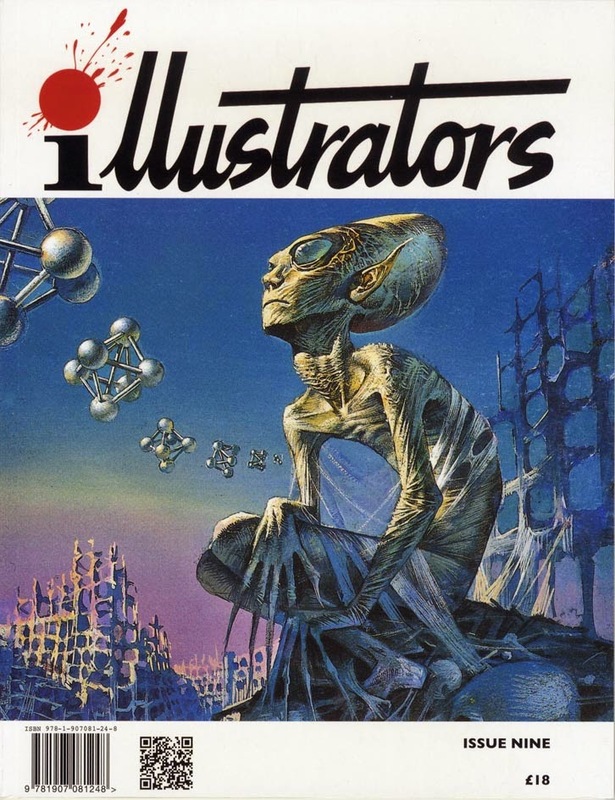 Here, in the latest issue of Illustrators, Pennington pens an autobiographical sketch revealing how he came to paint such fantastic subjects for the likes of Aldiss, Anderson, Frank Herbert, Ray Bradbury, Gene Wolfe and Clark Ashton Smith. Pennington had an early obsession with birds, his bedroom crammed with drawings and stuffed bids in cases. From the age of 14 he began selling wildlife drawings whilst attending Bromley Tech. He earned a place at Beckenham Art School but lost his enthusiasm for the course. Looking for work, he joined a firm producing film posters; in 1967, by now freelancing, he produced a trio of covers for Panther Book before hooking up with New English Library. His first cover, for Heinlein's Stranger in a Strange Land, was followed by Dune by Frank Herbert and Pennington was on the path to fame. 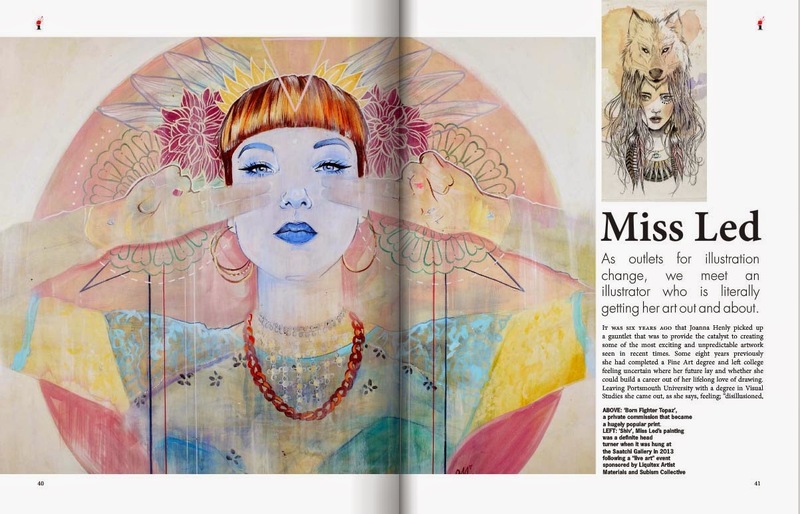 Miss Led is the star of this issue's second main feature, a look at the career of portraitist, mural artist and illustrator Joanna Henby, whose use of a pen-name and networking through social media opened up a whole new market for her 'Miss Led' artwork. From competitions to the Saatchi Gallery, her work combines retro-chic portraits, fashion and typography in a unique and beautiful way. Eric R. Parker is an artist I know well, but David Ashford's article managed to pluck a couple of really odd items out of obscurity, including an advert for the Tory party entitled 'She Wouldn't Say "Yes!"' 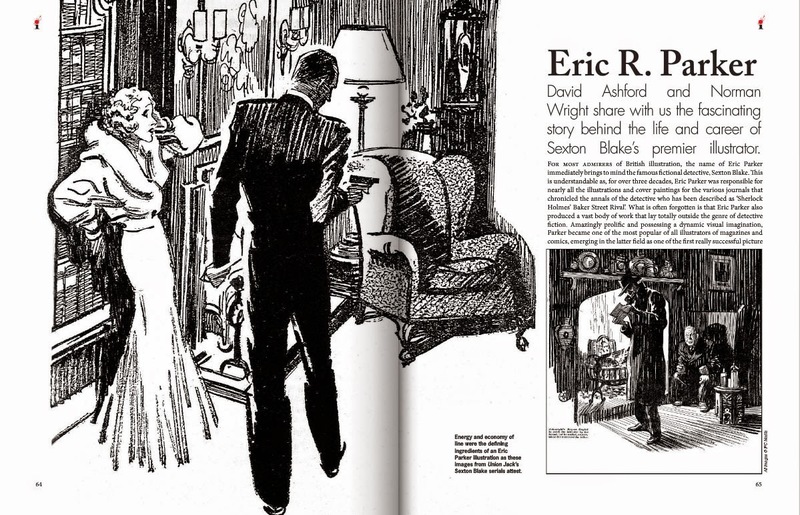 and material from his later days illustrating for Look and Learn and the like. He was a thoroughly reliable pair of hands when it came to accurately portraying the military but I have to confess that for many years I didn't think much of his comic strips. To my mind he was only good when he was painting covers for the Sexton Blake Library. What changed my opinion was putting his work in the context of when and where it was produced. I had the opportunity to look at some of his work from the 1940s as it appeared in Knockout and he made everyone else look unbelievably static and dull: there was so much movement and action in Parker's work it was astonishing. He always looked unfinished to my eye, but eventually I came to realise that he put in all he needed to put in to tell the story. It really was a revelation. 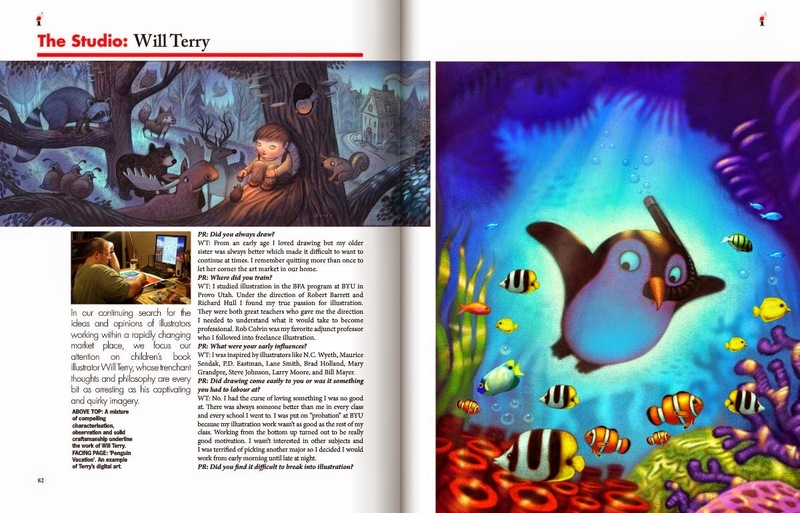 Wrapping up the issue is an interview with children's book illustrator Will Terry and a brief obituary for Bryn Havord, whose name was heavily associated with earlier issues of Illustrators until his death last year. The next issue is promising dinosaurs from William Stout and some lovely historical artwork by Patrick Nicolle. Roll on spring 2015.